Fate throws together three young men travelling on a train from Jamshedpur to Kolkata. Sunil is a graduate from FTII who wants to make a mark in Tollywood by directing his first feature film. Sameer aka Sam, is a software professional working in Silicon Valley. Dipankar aka Dipsy, decides to focus on music after being expelled from IIT on a false charge of peddling drugs. Dilemmas, disillusionments and desires blend to tell their tales in this delightful novel,which although reflective of the carefree ways and the fun loving spirit of the younger generation also attempts to encourage them to incorporate the sense of values which are synonymous with our Indian culture. 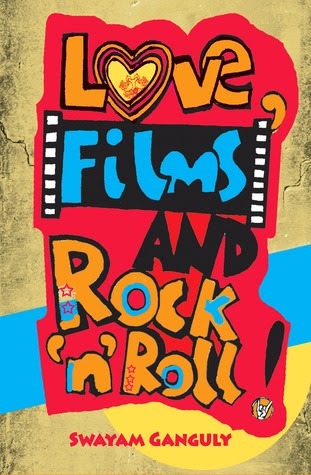 And they bind one and all through Love, Films and Rock n Roll! I really enjoyed the book. It’s entertaining and well written. I immediately felt connected to the characters and what they were going through. I thought that the author has done a brilliant job with the book. Even the secondary characters are well-developed. Its clear that the author knows what he is talking about be it about movies, music or love. I like the tidbits of information that has been provided through the entire book about music and movies. I have an urge to see Iranian movies now. The book is about the three guys, Sam, Sunil and Dipsy who meet on a train and forge a friendship. I liked all three of them. I came to care about them. It was relate-able, like listening to a friend tell their story and you cross your fingers and wish that they get their happy ending. Sam has come to India from U.S. in search of a wife, Sunil wants to make a movie and Dipsy, well, he just got expelled from IIT and is homeless and jobless. He starts a band with his friend, Walrus (interesting guy!) and is hoping for it all to work out. All three stories go on together and I liked all three of them equally. I couldn’t keep the book down, its a page turner that will have you hooked to it from the very start. The chapters are short and make it a quick read. I definitely recommend it.